Every time that anyone in your home uses water, the wastewater that is generated as that water goes down the drain is treated on your own property! Every time anyone flushes the toilet, or someone takes a shower, washes their hands, uses the washing machine, washes the dishes, all that wastewater needs to be cleaned and returned to the environment. It is the job of your septic system to clean the wastewater and re-introduce the treated water back into the ground and environment. If your home is not connected to the public sewer system, all the wastewater from your home is treated by an "individual wastewater treatment system", known as a, septic system. It is your job, as a homeowner to get your septic system cleaned regularly to ensure that it is functioning properly. The septic tank is a large box that is most commonly made out of precast concrete. Some septic tanks are made of metal or plastic. The size of a residential septic tank depends upon the number of bedrooms in the home and the regulations here in Ontario. The main purpose of the septic tank is to provide a place for all the solid wastes that leave your house to accumulate. Here the solid wastes can be dealt with by pumping them out of your system. Solids overflowing beyond the tank and into the leaching system should be avoided at all times. As time passes, solids continually accumulate in the tank. As the scum and sludge layers thicken, the clear water middle layer of effluent eventually gets "squeezed out". As this happens, solids will overflow into the leaching system every time water is run in the house. There are several different types of leaching bed systems. The purpose of the leaching system is to distribute effluent that overflows from the septic tank into the ground. Every time water goes down a household drain, water or (effluent) flows into the leaching bed system. The most common type of leaching system is a conventional. 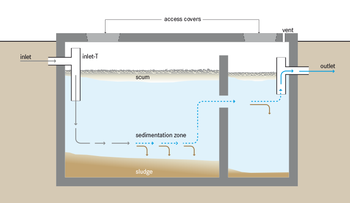 Other types of leaching systems include raised leach beds, modified raised beds, filter beds, area beds, tertiary / secondary units with leaching systems and conventional with distribution box. The size of the tank and the number of people using the system are important factors used to determine how often the septic tank should be pumped If the septic tank is neglected, solids will overflow from the tank and into the leaching system. This will result in clogged leach lines, and ultimately leaching bed failure, which can potentially contaminate soil, and your fresh water supply.